I know, the iPhone already comes with a pretty decent camera by all means and purposes, and for a particular moment in time where the world of smartphones is concerned, the iPhone’s camera was the best out of the lot, bar none. However, its competitors have definitely caught up and surpassed Apple’s efforts for some time already, and in a recent blind test, it was the Samsung Galaxy S5’s camera that actually came out tops. Still, this is not to say that the iPhone 5s’ camera is a slouch – far from it. This is where BiteMyApple.co comes in, having announced the availability of the Snappgrip for the iPhone 5 as well as iPhone 5s. 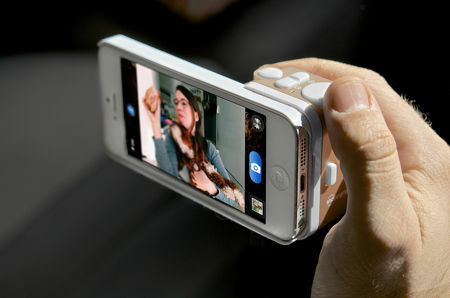 The Snappgrip happens to be an add-on controller which will transform your smartphone from Cupertino into that of a point-and-shoot camera, allowing you to capture favorite memories with one hand, while sporting additional control and functions. The Snappgrip will comprise of a protective case, and a camera controller accessory which snaps into the case back whenever you are ripe and ready to snap photos. In addition, this particular design helps you to steadily hold the iPhone with one-hand to ensure clearer images, at the same time to take full advantage of the smartphone’s camera capabilities. In fact, one can say that the buttons are more or less what one should expect to find on a real DSLR camera. In order to take a photo, all that you need to do is to fully press the shutter button, and you’re good to go. Need to focus your shot? Just half a press will do, where you can then adjust the shooting mode to portrait, landscape, flash, and video. Last but not least, there is also a zoom function which would enable you to zoom in or out on a subject. You can opt to pair the device using Bluetooth with the Snappgrip photography companion app in order to edit or share images, and picking up the Snappgrip will cost you $69.99 in either black or white shades.